In the seven months since the release of Star Wars: The Force Awakens I haven’t written anything about it except for a short article on my first impressions of my favourite characters from the film. Which is kind of strange since my favourite movie from 2015 was Star Wars: The Force Awakens. What an amazing film! It’s a movie that made me proud to be a Star Wars fan, brought my son back to Star Wars, my wife has proclaimed it her favourite Star Wars film and my daughter is proud of the fact that 21 years ago we chose Rae as her middle name, spelling not withstanding. I am incredibly excited for the exploits of Rey and Finn to continue in Episode VIII but I should probably mention now that the worst movie I saw in 2015 was also Star Wars: The Force Awakens. It’s a movie that has made me think that perhaps the story of Luke, Han and Leia didn’t need to continue after Return of the Jedi. At least not in the way that we saw last December. It’s a story that fans thought would never happen. George Lucas declared after being dumped on for years about the prequel films that he was finished making Star Wars films. He then revealed after the sale of Lucasfilm to the Walt Disney Company that he had been working on script ideas for sequels to the original trilogy. The only thing revealed about these new movies was that they would focus on a new era of heroes as the mantle (and lightsaber) was passed to a younger generation. And this is exactly what happened in The Force Awakens; except I’m not sure I like it. When it was revealed that Lucas’ story ideas were put aside by the producers of The Force Awakens my heart sank. Why wouldn’t his ideas be used? He’s The Maker! His comments after the movie’s release that, “I think the fans are going to love it. It’s very much the kind of movie they’ve been looking for,” suggests just how far from his ideas the new team may have gone. Ever since I saw Return of the Jedi in 1983 at the Vanity Theatre in Windsor, Ontario I have looked at the Star Wars films as a fairy tale. When the screen irised out on our heroes at the end of that film one could have expected a title card reading, “…And they lived happily ever after.” The story we had been following since 1977 had come to an end with evil vanquished and freedom restored to the galaxy. Lucas had always had in his mind an idea where Luke Skywalker would return as an old man to “hand Excalibur off” to the next generation but I never imagined when Star Wars returned to the big screen that said hand off would involve a missing Luke Skywalker, alone on a planet, leaving the Jedi order he established. His sister, Leia, continues her life as a soldier fighting against a new threat to the galaxy that has flexed its muscles by destroying multiple planets. Leia is estranged from Han Solo and their son is one of the leaders of this new dark side regime. So much for the prophecy of The Chosen One. Oh, and Han Solo dies. 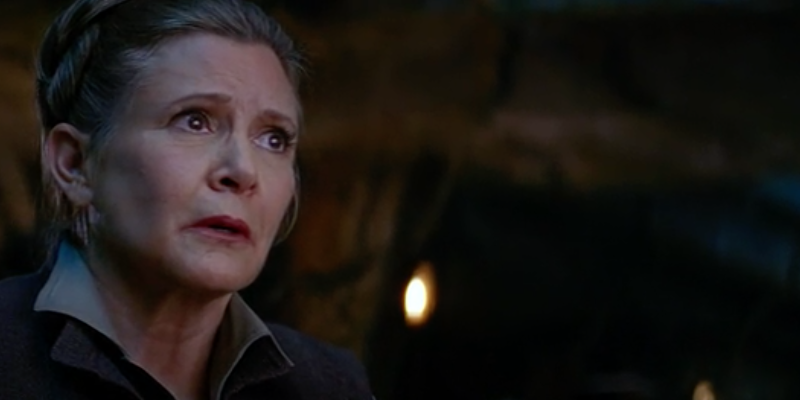 The Force Awakens became the first movie I have ever seen that I nearly walked out on. Like so many other Star Wars fans I was shocked and stunned when Kylo Ren ran his saber through his father. I spent a good five minutes trying to get my breathing under control and the pounding in my head to subside. It was a physical effort to sit in that theatre seat as the film continued. And please, don’t get me started on “Ford wanted an ending for his character.” This is a fantasy film, I don’t need reality intervening when I’m in my theatre seat. Maybe it’s the fact that I have never been much of a fan of how Star Wars print fiction treated the heroes of Star Wars in the thirty years since Return of the Jedi. I do have my favourite titles in Star Wars fiction but I have never felt the story of the heroes of Star Wars to be very compelling after the celebration on Endor. Again, it’s that fairy tale ending of the original trilogy that has stuck with me all these years. I completely understand people’s desire to extend this story but I would have liked to have seen less involvement from Luke, Han and Leia in the events of the galaxy. It’s funny but the image that came to me when I was making notes for this article was that scene in The Princess Bride with Miracle Max where he tells the heroes of that film to “have fun storming the castle.” I almost feel like this is what I would have wanted in this new sequel era: the old guard sending the new guard on its quest-minus the death, destruction and separation, of course. As big as The Force Awakens was in our household there was another film that had equal status, the live-action version of Cinderella. We are all familiar with the end of that old story; the heroine and her new husband live happily ever after. I would not want to see a sequel to this story where Cinderella’s evil step-mother returns to the kingdom with an army to storm the castle after the wedding. It’s the same with The Force Awakens. I’m excited about the new stories being told but did they have to be told through the misery of characters we thought had found happiness after a galaxy-wide struggle? Of course part of my angst comes from the simple fact that for the first time in thirty years Star Wars is a new story again and it’s ending is unknown. Not since Han Solo was frozen in carbonite and Luke Skywalker discovered who his father was have I worried so much about these beloved characters. Maybe it’s symptomatic of the world we live in. With so much violence and evil in the world today I look to Star Wars more than ever for excitement, for fun. I look to it for escape. I hope that as this new trilogy progresses it will focus entirely on the exploits of Rey, Finn and Poe and that it will resolve the conflict that our heroes thought they had resolved so long ago on the forest moon of Endor. They’ve earned it. Now, I’m going to go watch Star Wars: The Force Awakens again because I just can’t seem to get enough of it! I welcome your feedback! My email is MikeM@coffeewithkenobi.com. You can find me on Twitter @MikeTarkin. You can also find me at Retrozap.com and at my website, MikeTarkin.com–Star Wars In My Corner of the Galaxy. Love this, Mike. It gives me a lot to think about! Thanks Pam! It’s such a weird situation to be in. I love the movie and love that we’re getting more, just not sure of the execution of it.